I used to be an adrenaline junkie. Love adrenaline heart pumping exercise classes like Zumba, spinning and sh’bam. I was never interested in yoga, seemed like a waste of time.. so still and boring. One day I hurt my ankle and could not do the high intensity classes so I decided to give yoga a try. Before I know it, I am hooked. Today, I practice yoga every day. It’s hard.. I still can’t do headstands but I am improving everyday. I love it because I feel good after every yoga practice..which is not the feeling I get after those high intensity classes. I get a good dose of wellness both physically and emotionally. I love this phrase in Ashtanga yoga… Samasthitih. This is used when we transition from one set of movements to the next. It means coming back to our center. Leaving behind what we just did and starting afresh, looking forward to our next set of movements. 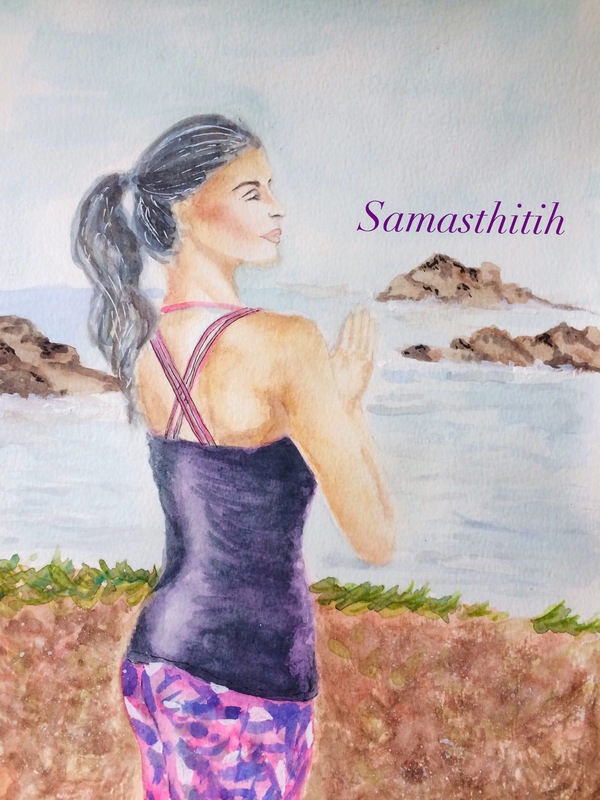 I love this idea of Samasthitih even outside of yoga. Too often we get stuck in our past, not looking forward. Samasthitih.. yes. Re this painting… definitely stretching beyond my comfort zone. Painting the human figure and nature are both not easy for me. Glad I gave this a go.